When Bev Russell was just a little lad growing up in England, he considered it quite a treat to spend time with his grandmother. The clean and comfortable house on Shirley Road in Southampton had a quaint English charm about it and the matronly lady that lived there had a certain aura of dignity about her. And she was a wonderful cook. Often she was heard singing her favorite song, A Garden In Grenada, as she went about her daily chores. She was kind to her grandchildren and those that knew her hold onto their memories of the lady as precious keepsakes. In the days when the children used to visit her, their grandfather was still living too. But none of them ever met him, and no reason was ever offered as to why he never seemed to be around. In later years they would know the story of how he steered the great ship Titanic into an iceberg in 1912. But not one of them would ever know for sure what finally became of him. Until now, that is. Florence Mortimore was still a teenager when she met young Robert Hichens in early 1906. The spark between them was immediate and on a Tuesday night in the summertime, they took a leisurely stroll together prior to Robert’s going to sea. The next day, the young sailor made his interest known. I now take the opportunity of writing these few lines according to my promise hoping you are none the worse for your nice little walk last night. I only wish I had met you at 5 or 6 o’clock and I would have seen more of you. I suppose you don’t know that I have taken rather a fancy to you. Love blossomed and marriage followed late in the year. Daughter Edna Florence arrived in 1908 while the couple was living in a small flat at 1 Coburg Place, Torquay. Another daughter, Frances, followed in 1910. About that time they returned to Southampton and were living at 45 James Street in April of 1912. Florence was again pregnant when Robert sailed on the voyage that would bring fame and infamy to his name. The young man from Newlyn, Cornwall was not yet 30 years old when he signed on as one of 6 Quartermasters on the RMS Titanic. Although he had previously served as Quartermaster on a number of other ships, one can imagine the pride felt by his wife and his parents in knowing that their loved one would hold a position of some responsibility on the famous new luxury liner. But responsibility would come to mean something much different than they had imagined. On the night of April 14, 1912 Florence Hichens was safe asleep at home, 6months pregnant, and had no inkling that the father of her unborn child was in peril of never seeing his third daughter. The Quartermaster had started his watch at 8 P.M. and it had been an uneventful evening when the midnight hour approached. 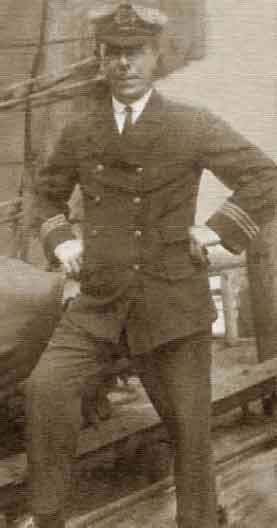 After lookout Fred Fleet spotted the iceberg and passed the word along the chain of command, it was Robert Hichens that received First Officer Murdoch’s order to turn “hard a’ starboard” and he spun the ship’s wheel urgently and forcefully. In later testimony he acknowledged hearing the scraping noise as the iceberg dealt its lethal blow. At 12:23 A.M. he was relieved at the wheel by Quartermaster Perkis. Well after midnight, when the lifeboats began to fill, Hichens and Fleet were assigned to #6 and a group of over two dozen women from an assortment of backgrounds were to find salvation there. Among them was Mrs. Margaret Tobin Brown of Denver, Colorado. The unlikely pairing of the rich and feisty IrishAmerican woman and the cantankerous Cornish man would soon become legend. A young steerage man with a broken arm had also managed to hide in the bottom of the lifeboat and Canadian Major Arthur Peuchen was allowed to join the small group to assist with manning the vessel. Boat #6, with a capacity of 65, departed with less than half that number on board. The story of what transpired in lifeboat 6 after its launch tainted the reputation of Robert Hichens forever, but it also assured a sort of immortality for him. With only three able men rowing, the group was not making enough headway in leaving the doomed Titanic. Capt. Smith had ordered them to pull for an enigmatic light on the horizon, off-load the women on whatever vessel they might find, and return to save others. Hichens quickly felt the need to assert his authority and relegated Fleet and Peuchen to rowing while he remained at the tiller. By the time Titanic foundered, lifeboat 6 was far enough away that they were unable to see the big ship clearly. Some of the women began to insist on returning to save the desperate swimmers screaming for their lives but Hichens would have none of it. He complained with graphic descriptions that they would only be swamped and drowned themselves and later proclaimed that they would find nothing but a bunch of “stiffs” anyway. Through the rest of the night he did little but swear at the boat’s occupants and cruelly taunted them with dire predictions of spending days on the frigid North Atlantic without provisions. But the indomitable spirit of “Molly” Brown would triumph over Hichens’ pitiless pronouncements and she began to organize the women in rowing. Hichens fumed that he was in charge of the lifeboat but Mrs. Brown was unfazed by his rantings and finally threatened to throw him overboard herself. Not doubting her word, he settled back under a blanket and continued to mutter epithets to himself. Margaret Brown was now in charge of lifeboat 6. When the Carpathia approached at daybreak, some occupants of Hichens’ group thought they saw a blast of light in the distance and hope surged through the cold and exhausted women. Robert dismissed it as a shooting star. And later when it was obvious that a rescue ship had arrived, he informed the survivors with a tone of finality that the ship was there to pick up bodies, not to rescue them. After the hapless survivors of Titanic were safely aboard Carpathia, Robert Hichens avoided the women that he had taunted through the night and told his own version of what had transpired in lifeboat 6. Later at the American Inquiry, the stories told by other occupants of the boat contrasted sharply with what Hichens declared. And then the survivors of the most famous maritime tragedy in history dispersed to continue their lives. Margaret Brown’s heroics in the lifeboat brought fame and celebrity her way and her life was to be chronicled in minute detail in the decades that followed. But Robert Hichens’ post-Titanic life was to be more mysterious. Although Robert was demonized by most of those that encountered him on that fateful night, there was a family back in Southampton that loved him dearly. Members of the Hichens family were alarmed and fearful when news of the great disaster reached them. Friends of Florence feared that she might miscarry and Florence herself wondered how she would support three children without her husband. But good news reached them shortly and by Saturday, April 20th, Robert’s father wrote a letter bearing the news to his daughter. Only a portion of the letter survives. Robert Hichens returned to England on May 4th aboard the Celtic. In July of 1912, he and Florence welcomed another daughter, Phyllis May. Three more children followed, all born in Southampton: Robert (Bob) in 1913, Ivy Doreen (Babs) in 1915, and Fred in 1925. Robert himself was absent from the family for long periods as he continued his career on the high seas. There were rumors that the White Star Line shipped him off to Cape Town so that he could not be questioned further about the events surrounding the Titanic sinking and it was even alleged that he once served as Harbourmaster at Cape Town. However, these claims have not been verified. Family members do recall that he spent time in Durban and Johannesburg and that he was always able to obtain money from some source related to Titanic—so it is quite possible and plausible that some sort of remuneration did occur in the years immediately following the disaster. During World War I he served in the Royal Naval Reserve and continued to work on smaller ships for more than two decades. In the 1920’s he frequented the Orient and spent a great deal of time in China and Hong Kong, always returning to Southampton with gifts of fine china adorned with Geisha girls. It was rumored within the family that his adventures included gun running and piracy. During these escapades in the east he himself was robbed on more than one occasion and developed a lingering distrust for “Chinamen.” As a result he kept an array of weapons even in the family home in Southampton in case “Chinamen” were to break in and kept a wary eye out for them the rest of his life. Within the family, Molly Brown did not hold a position of high regard. When her name was brought up on any occasion, Robert would say, “She could have walked into any lifeboat on the Titanic! Why oh why did she have to walk into mine?” The family believed that Molly was accustomed to taking control as a result of her wealth and privilege and adhered to the principle that working class seamen such as Hichens should stay in their place. Despite his frequent absences from home, Florence and the children seem to have lived a happy existence in Southampton. Three of the daughters were beauties and it was not uncommon for locals to remark that they had seen “the Hichens girls” out stopping traffic on High Street. Edna Hichens was one of the beauties. She was to marry Bernard McKno and together they owned a pub/restaurant in Southampton and raised two daughters, Vivian and Brenda. They had a happy and somewhat prosperous life but Edna must have borne some embarrassment about her father. When Edna’s younger daughter was contacted in the course of research on Hichens, she did not know that her grandfather was the Robert Hichens of Titanic fame. It had never been discussed in the McKno household. Edna’s life was cut short by breast cancer when she was 48 years old. Frances Hichens was a plain woman and not one of the “traffic stoppers.” She had red hair and did not possess an outgoing personality like her sisters and never wore make-up. She never sought out excitement and was not as close to the other Hichens siblings. 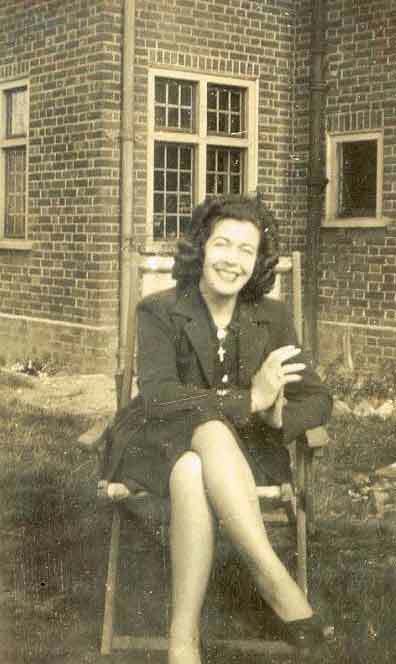 Never married legally, she had a common-law relationship and two sons, Barry and Noel, with Percy Kelsey and lived in London and Southampton. She was the last survivor of the Hichens children. Earlier, Percy Kelsey committed suicide on the train rails in London after becoming despondent over giving up his treasured garden after moving into public housing. Phyllis Hichens referred to herself as “the Titanic baby.” The most beautiful of all, she had a fun-loving, vivacious quality about her and everyone enjoyed being with her. It was said that she had a smile like someone that swallowed sunshine. The locals in Southampton even referred to her as “Glamour” and young men would wait for her to pass by just to look at her. She was first married to Alfred Stanley Russell and had three sons, Graham, Bev, and Warner, and then divorced him to marry a soldier named George Veal. The marriage to Mr. Veal was short-lived and Phyllis then had a romantic relationship with a young Irish soldier remembered only as “Charmie.” After his departure from the scene Phyllis managed a café and frequented a pub called Sir John Barleycorn where she was popular with the many young American soldiers that stopped in. It was at her café that she met John Waters and the two were later married. Phyllis had a final son, James Michael Waters. Always gregarious and attractive, she lived out her later life in Telford. John Waters proved to be a loving husband and father to James and was at Phyllis’s side during a long, brave battle with cancer. She died at the age of 63. Robert “Bob” Hichens lived at Cadnam near Southampton and was an accomplished pianist and songwriter. At an early age he lost a leg in an accident with a tram while riding his bicycle. He never married but was at one time engaged to a girl named Eileen who ran off with an American soldier. After that, Bob never “courted” again. During the “Black-Out” in World War II he was the driver of a vehicle that hit and killed a cyclist on Christmas Eve. The man left twin boys and the tragedy haunted Bob the rest of his life. He was employed as a “wages clerk” in Cadnam prior to his death from a heart attack at the age of 57. Ivy Doreen (Babs) Hichens was another beauty and is said to have “taken the men’s breath away” at the local pub in Cadnam. When she was 20-years old she went to work in a Southampton grocery owned by Mr. and Mrs. Fred Woolgar. Fred was a married man 17 years her senior. Flirtation turned into more and when Mr. Woolgar’s wife found out she severed all financial support and Fred lost his grocery. He was said to be a charming and very gentlemanly chap and although frequently separated, he stayed with Babs on and off until his death. Their son Paul Woolgar was a well-known boxer/prize-fighter in London. They also had a daughter, Susan. Babs would often play cards far into the night and sometimes lost heavily. After moving to Hounslow, she had an affair with “a local Romeo” but then went back to Fred Woolgar. For years she ignored a lump in her breast and by the time cancer was diagnosed, nothing could be done for her. Her sister Frances stayed with her during her final days. On the night of her death she told Frances that “sister Edna was here last night.” (Edna had been dead for 16 years.) Babs Woolgar died at the age of 58. The final Hichens child was Frederick John, born 10 years after his nearest sibling. He served in the army during World War II but was thrown out of O.C.T.U. Officer Training when caught playing cards. He was a clever man and well liked and cared for his mother during Robert Hichens’ long absences from Southampton, even though he was only a boy himself. He married and had three children (Janette, Robert and Frederick) and was a flooring contractor in Sandhurst, Camberwell, Surrey. Fred died of a heart attack just weeks after his 60th birthday. But what finally became of old Robert Hichens? There were rumors that he was killed in the bombing raids of London in the early 1940’s. There were rumors that he was killed in a scuffle in Hong Kong. It was claimed that he was still serving on a ship near Devon in 1942. There was a rumor that he died of measles aboard a ship in the North Atlantic. There was a rumor that he was killed by a bomb (or died of a heart attack) while serving on a ship in Portsmouth Harbour. All were just rumors. None were true. Even his children did not know for sure. And not one of his grandchildren remembered him at all. This is the rest of the story. Robert Hichens was away from his family for most of the decade of the 1930’s. He fell on hard times in the early years of the decade and had trouble finding work. In late 1933, after an evening of heavy drinking, Robert took a taxi to the home of Harry Henley in Torquay. Earlier the two men had been involved in a transaction involving the sale of a motor vessel and Robert had come to blame Henley for his present woes. The Torquay Times of December 1, 1933 carried this account of what transpired that night. There were two letters found on Hichens when he was arrested and one written to his brother indicated he intended to murder Henley and then commit suicide. When he appeared at the Winchester Assizes in late November, his wrists were bandaged due to a further suicide attempt after his arrest. 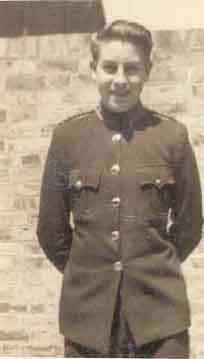 Robert Hichens spent several years in prison as a result of the attempted murder of Harry Henley but was released in 1937. In 1939 Florence Hichens began to suffer severe headaches and after a time was diagnosed as having a brain tumor. Robert returned to Southampton and would not consent to surgery, thinking that Florence could improve without it. Neighbors and friends helped young Fred Hichens to care for his mother at the family home on Shirley Road but Robert remained until her death on March 23, 1940 at the age of 53. Very soon after her funeral he left Southampton and never returned. Fred was only 14 when his father left him behind. By the summer of 1940, the old Quartermaster of the Titanic had found work as Third Mate aboard the ship English Trader. He was 57 years old and his health was not good owing, no doubt, to the years of living hard. On the evening of July 19, 1940 Hichens informed the ship’s doctor that he was too ill to keep his watch on the bridge. He had been unable to keep food down and his heart was thumping heavily. The doctor ordered him to rest and gave him a small dose of brandy. His temperature was 100. Two days later his fever had dropped slightly but Hichens was still laid up and was given a tonic mixture. On the afternoon of July 24th, the doctor again examined the Third Mate and stated that he was suffering from Asthmatic Bronchitis and ordered a diet of cold milk and vegetables. On August 5th the doctor asked Hichens if he needed to be examined and he replied that he did not. Then on September 19th Hichens again reported that he was sick and unable to keep his watch on deck. He complained of pains in the stomach and fever though his temperature was found to be normal. He was then given two laxatives. That night he was still laid up and was given a dose of Black Draught. On September 20th the doctor reported that Third Mate Hichens’ bowels were well open and his temperature was normal but that he refused all food. Nor did he take any nourishment the next day. Several years later Fred Hichens and his wife Dorothy went to extraordinary lengths to determine what had become of his father. Although they never were able to obtain exact information, they were advised that he had died while serving on the English Trader and his body was buried at sea. Today, grandchildren of Robert Hichens as well as his daughter-in-law Dorothy still live in England and are respected and honourable citizens and successful in their careers. In April of 2002 a number of them attended the British Titanic Society Convention in Southampton and were introduced to Muffet Brown great-granddaughter of Molly. Fortunately, the second meeting of the two families was much friendlier than the one in April of 1912. Perhaps Molly and Robert would be amazed to know that 90 years after lifeboat 6, their descendants would eat, drink, and be merry together in the restaurants and hotels of Southampton.